Phill Gonzales made his first drawing when a girlfriend tore up a photo from his wallet, and he decided to reproduce it from memory. From then on, he kept making art – not with any formal training, but by making connections with artists he met throughout his life. His mentors included a court artist for the Dutch royal family and abstract painter and printmaker Bill Bomar. 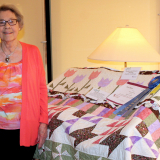 “It’s an honor because it was going up against some pretty doggone good pieces. That’s pretty impressive. It surprised me,” he said. 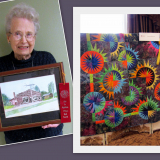 At the 2017 Art is Ageless exhibit at Manor of the Plains in Dodge City, Phill took home three amateur division prizes: first place in painting and drawing, and second in mixed media/crafts. He has tried his hand at most art forms, Phill said, and he lets inspiration be his guide. “There’s a little voice inside you that tells you what to look for and how to do it. I guess every person who does art has that voice in there,” he said. “Girl Reading a Book” is a copy of a classic painting that Phill liked, but he altered the child’s face to resemble his own granddaughter. 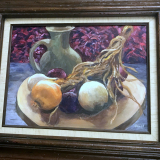 “I am mostly influenced by Baroque and Renaissance art; those are my two favorite periods. I’ve done lots of work trying to imitate the great masters,” he said. Phill’s art also incorporates the motifs of Native American and Mexican art into much of his work. He lived in New Mexico off and on while he was young, served in the Army, and eventually moved to Dodge City after he graduated from college there. 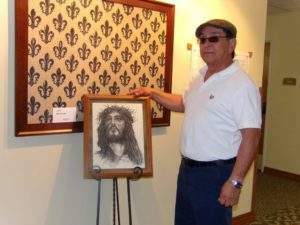 Some of his favorite Southwestern and Mexican artists include R.C. Gorman, Ettore “Ted” DeGrazia, Diego Rivera, and Frida Kahlo. Last summer, a highlight of his trip to New York City was going to the Museum of Modern Art, where he studied classics by Picasso and Matisse up close. So he’s thinking of taking a bit of a break, and possibly getting more of his pieces into exhibits. 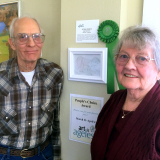 Some have already been displayed at a gallery in Tucumcari, N.M.
Congratulations to Phill on his Best in Show recognition!